Yep! Sharope (shah-ROH-peh) is a spoon sweet. It’s a kind of meringue – a marshmallow creme, really – in which hot sugar syrup, rather than dry granulated sugar, is beaten into egg whites for a long, long time with a wooden dowel. Dry sugar separates quickly from beaten egg whites, but the cooked syrup is more stable and doesn’t separate (this, by the way, is also the process for making Italian meringue), so this is a sweet you can make and store in a jar. Sharope might be flavored with lemon or almonds or, as in your grandmother’s case, vanilla, which would be delicious. I’ve never heard of anyone kneading sharope on the floor! It’s not usually so dense to even allow for that kind of handling, although the longer you beat the meringue, the more taffy-like it becomes. I’m guessing your grandmother either beat the meringue for a VERY long time or that she added mastic, which is what gives Turkish ice cream its taffy-like texture (For further explanation, take a look at my post about Dondurma). If you’re familiar with Marshmallow Fluff, it’s pretty close to sharope – but it ain’t the same. Thanks for your question, Yael. A good one! 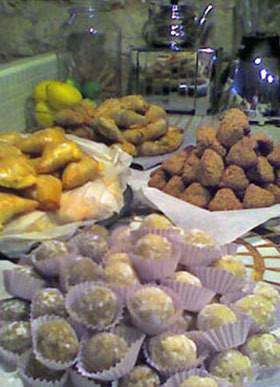 Cooked sweets – purees, compotes, marmalades, pastes, hard candies and whole preserves – are an important component of the Sephardic culinary tradition and social custom. Whole fresh and dried fruits, citrus peel, flower petals, seeds, nuts and even vegetables are transformed into confections of various textures, forms and colors, to be served, with tea or coffee, when folks come a callin’. My own grandparents and great grandparents favored sweets made from quince, almonds, apricots, citrus peel, rose petals, apples, dates, figs and sesame. Depending upon where in the Mediterranean you might be you’d also enjoy sweets made from lemons, pears, sour cherries, grapes, plums, tomatoes, pumpkin, eggplant – you name it. The Moroccan recipe in these pages for Berenjenitas en Dulce – candied baby eggplants – is a fine example. The list is endless. In the foreground, a plate of pistachio and lemon masapan. Photo © Janet Amateau. MASAPÁN (“mä-sä-PÄN) – To most people outside of Spain this is marzipan, but the similarity ends there. Traditional Sephardic masapán is made from fresh, ground almonds (or a mixture of almonds plus other Mediterranean nuts), sugar and water, and may be scented with a few drops of rose water. It is delicate in flavor, texture and color – neither gummy nor icky-sweet, and tinted only with the hues of its natural ingredients: creamy ivory from blanched almonds, delicate brown from hazelnuts, soft green from pistachios, pale yellow from lemons. Masapán is a compound word formed from “masa” (dough) and “pan” (bread). The recipe contains no grain flour, however, for which it is presumed to have originated as a Passover confection. Whether or not invented for that specific holiday, it is Jewish in origin and identified as such in documents from the Spanish Inquisition. Masapán is still a prized confection in modern Spain, where it is a specialty of Toledo (a city of major importance in Sephardic history) and of various orders of nuns.